WINFIELD, Kan. – All 14 players that played scored for the Kansas Wesleyan Coyotes as KWU won inside Stewart Field House for the first time since 2011 as Wesleyan routed the Southwestern College Moundbuilders 93-58 on Thursday night. Wesleyan’s last win inside Stewart Field House was on January 27, 2011, a 92-66 win for the Coyotes. It equals the most points scored since scoring 93 against York on December 8, 2016 and is the most since scoring 96 on February 2, 2015 against Grace, Neb. It was another balanced scoring attack for the Coyotes, led by 12 points each from Courtney Heinen (JR/Axtell, Kan.) and Kayla Kivinski (SR/Port Richey, Fla.). Sydney Mortensen (SR/Wichita, Kan.) added 11 points and Gabbie Miller (SR/Kiefer, Okla.) had ten. The Coyotes rocketed out to a 24-4 lead to open the game as a free throw by Amanda Hill (SO/Rossville, Kan.) put the Coyotes up by 20 with 3:23 left in the opening quarter. The lead reached 22 points on a triple by Courtney Heinen that made it 29-7 as the Coyotes led 31-10 at the break. After Southwestern scored the first two points of the second quarter, the Coyotes answered with another decisive run. Sparked by a bucket by Mackenzie Herman (SO/Rose Hill, Kan.), the Coyotes went on a 10-0 run to take a 41-12 lead with 5:44 to go in the quarter. A free throw by Jayme Sloan (JR/Bennington, Kan.) would give the Coyotes a 48-22 lead at halftime as KWU was 20-of-39 in the first half for 51.3 percent. Kivinski’s three-point play with 8:18 to go in the third gave the Coyotes a 30-point cushion for the first time in the game at 57-27. Amanda Hill’s 3 with 1:44 to go gave the Coyotes a 74-34 lead. A bucket from Lauren Flowers (FR/Overland Park, Kan.) with 5:41 to go gave the Coyotes their biggest lead of the fourth quarter at 84-49 as the Coyotes cruised to the 93-58 win. Wesleyan shot over 50 percent from the field for the game at 50.7 percent (38-of-75) and the Coyotes were 6-of-13 from 3-point range for 46.2 percent. The Coyotes did struggle from the line, connecting on only 11-of-26 charity tosses for 42.3 percent. Wesleyan also enjoyed a wide rebounding margin 51-29 led by seven from Flowers, while Mortensen, Gabbie Miller and Hill had six each. The Coyotes are back at home on Saturday hosting Avila at 5 p.m. inside Mabee Arena. The Kansas Wesleyan men battled Southwestern on even terms for 29 minutes before the No. 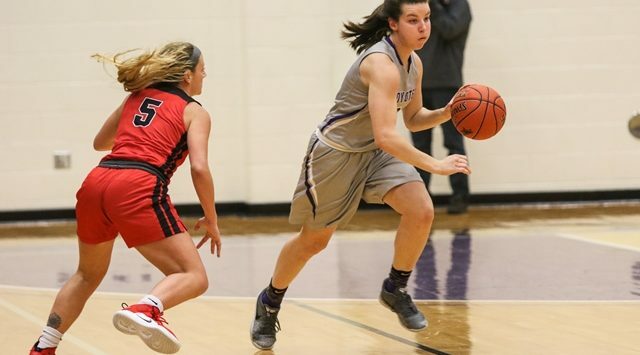 14-ranked Moundbuilders pulled away down the stretch. Trailing 50-48 with 11 minutes left, Southwestern used scoring runs of 9-1 and 11-2 to build a double-digit lead, then held off KWU’s late comeback attempt for a 71-63 Kansas Conference victory Thursday night at Stewart Field House in Winfield. The loss drops the Coyotes to 3-4 overall and 1-3 in KCAC play while Southwestern remains unbeaten at 9-0 and 5-0. Wesleyan led by eight twice in the first half, 17-9 and 19-11, but Southwestern outscored the Coyotes 29-15 the rest of the half and led 40-34 at the break. Two Marquis Kraemer (SO/Aurora, Colo.) free throws capped a 10-0 KWU run and gave the Coyotes a 50-48 lead with 11:38 left in the game. Southwestern responded with the 9-1 run – Cameron Hunt, the KCAC’s second leading scorer, accounting for six points. Field goals by AJ Range (SO/Junction City, Kan.) and Kraemer pulled Wesleyan with 57-55 with 8:33 left, but Southwestern pulled away with the 11-2 burst that included three consecutive 3-pointers for a 68-57 lead with 4:06 remaining. James Brooks (JR/Cherokee, Kan.)’ layup with 27.9 seconds left trimmed the KWU deficit to 69-63, but the Coyotes couldn’t score the rest of the way, committing a turnover, missing two field goal attempts and misfiring on the front end of a one-and-one opportunity. Wesleyan shot 40.6 percent from the field (26 of 64) – 45.5 percent the first half (15 of 33) – but was just 3 of 20 from 3-point range and 8 of 16 from the free throw line for the game. Kraemer scored a team-high 17 points on 6 of 10 shooting and also had four assists, four rebounds and three steals. Itello Cross had 13 points on 6 of 8 shooting, four rebounds and three blocks off the bench, and Brooks 10 points and two steals. Andrew Hamm paced Southwestern with 18 points while Hunt had 17 – 12 below his average – and five rebounds. Simpson Anderson added 11 points and Brent Smith had 11 rebounds to go along with seven points. Southwestern shot 52 percent for the game (26 of 50), including 9 of 25 beyond the arc. The Moundbuilders also won the rebounding battle 36-29, which helped them overcome 18 turnovers that led to 19 Wesleyan points. KWU had nine turnovers that produced nine Moundbuilders’ points. The Coyotes return home Saturday for a game against KCAC-newcomer Avila. Tip-off is 7 p.m. at Mabee Arena. Avila fell to 0-6 overall, 0-4 conference play, with a 72-65 loss to Bethany on Thursday in Kansas City, Mo.